We deploy two moorings in order to keep track of water exchanges over the sill; they will collect data for a year. 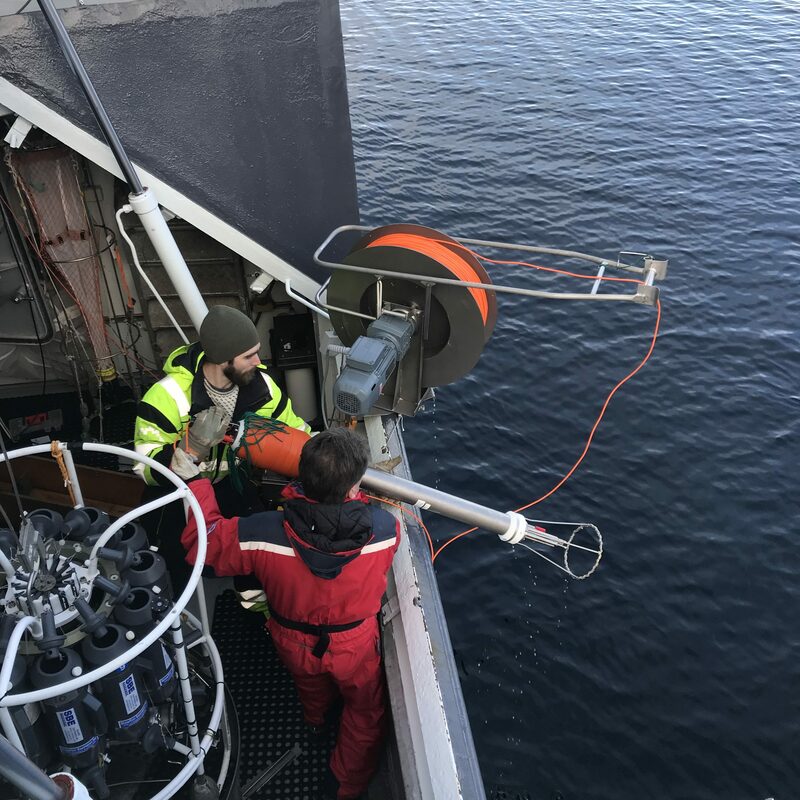 Instruments recording temperature, salinity, pressure, and velocity are attached to a rope, which is kept in place by an anchor and floating elements. One mooring is anchored on top of the sill (75m), whereas the other one is placed within the first basin at 460m depth. 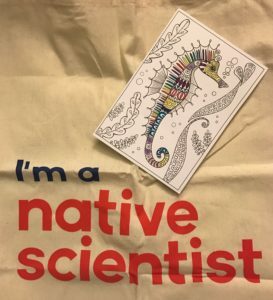 This blogpost is one of a series written originally for our Insta-takeover of @PortalenIGLO, by the awesome night watch team Elina, Helene, Julie, and Sonja. 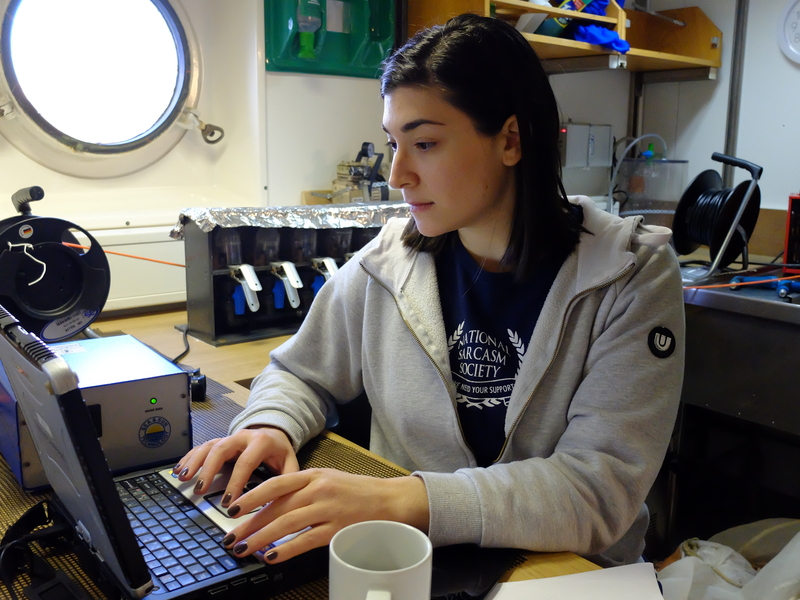 Check out the twitter accounts of Elina and Sonja for updates on what they are doing when they are not at sea with us! The video showing milk being poured into water is an example of the small-scale process ‘turbulence’. In the ocean, turbulence is important for mixing of different water masses. 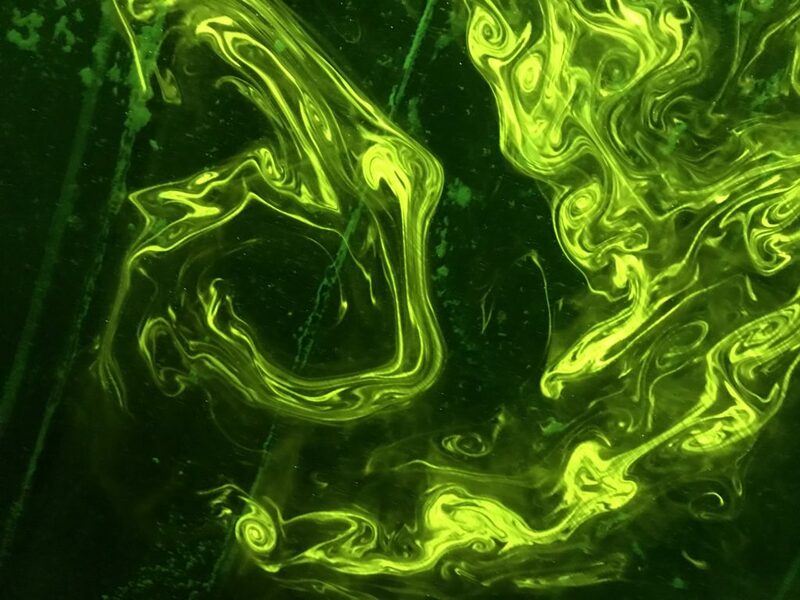 We measure turbulence with a Micro Structure Sonde (MSS) by letting the instrument fall freely down the water column, recording temperature changes and water movement at a frequency of 1024Hz. 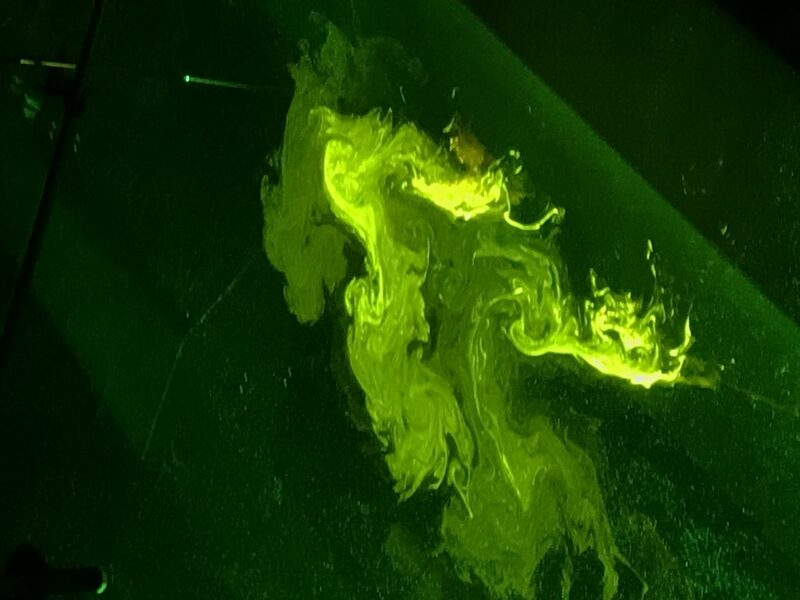 If you are interested in reading more about this, check out Mirjam’s blogposts on how to sample and how to measure dissolved oxygen! 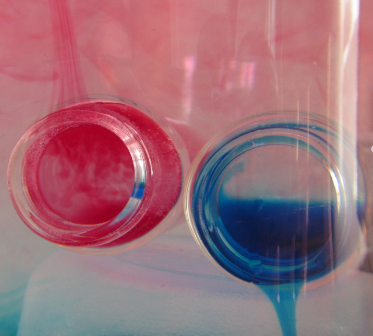 And a special post with focus on the color change of the indicator when titrating oxygen. In order to measure the oxygen levels, we lower down an instrument called CTD (as seen in the picture). The CTD measures conductivity (salinity), temperature and depth (pressure). It has grey plastic bottles attached to it, with which we can take water samples at different depths and analyze for oxygen content in the lab. 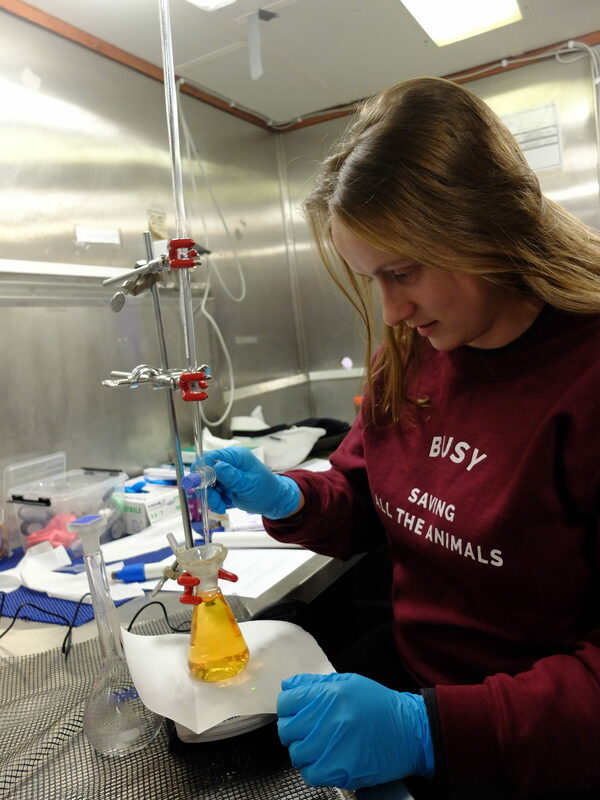 By adding chemicals to the water samples, we bind the oxygen so that we later can calculate the concentration through the titration technique. Masfjorden is 24km long, branching out from Fensfjorden. Masfjorden has three sills (a sill is an underwater barrier), which prevent the undisturbed water flow in and out of the fjord. This is why the oxygen levels near the sea floor are particularly low, limiting the marine life as well as decomposition processes. To get new oxygenated water into the basins, dense Atlantic water needs to flow over the sill – this does not happen very often! 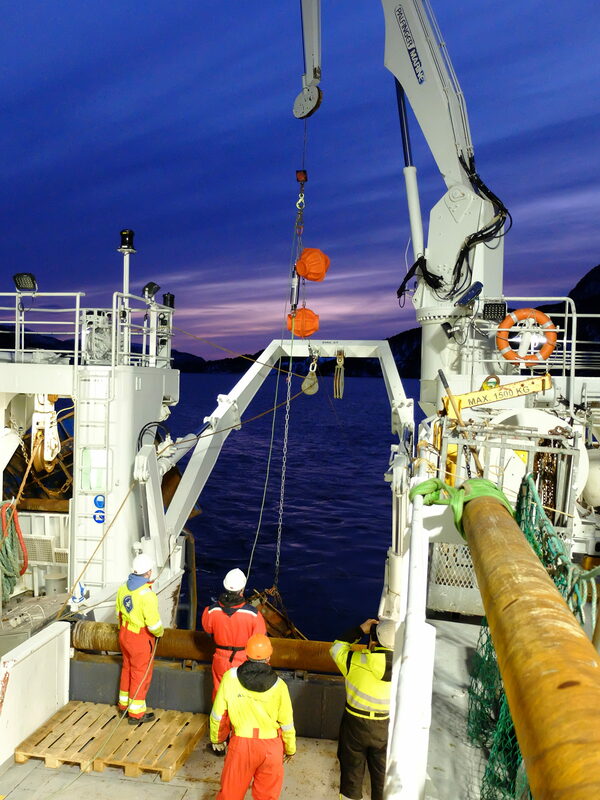 This week we will study the Masfjorden water masses through a series of measurements. 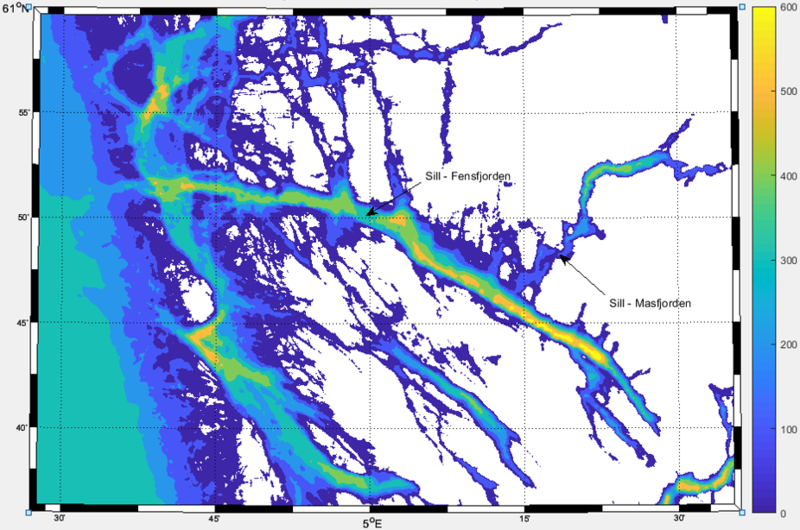 Map of the bathymetry of Masfjorden and Fensfjorden. The deepest parts are yellow, the shallowest parts are blue. This week we are a group of UiB students going on a cruise, and we are taking over the #portalenIGLO. 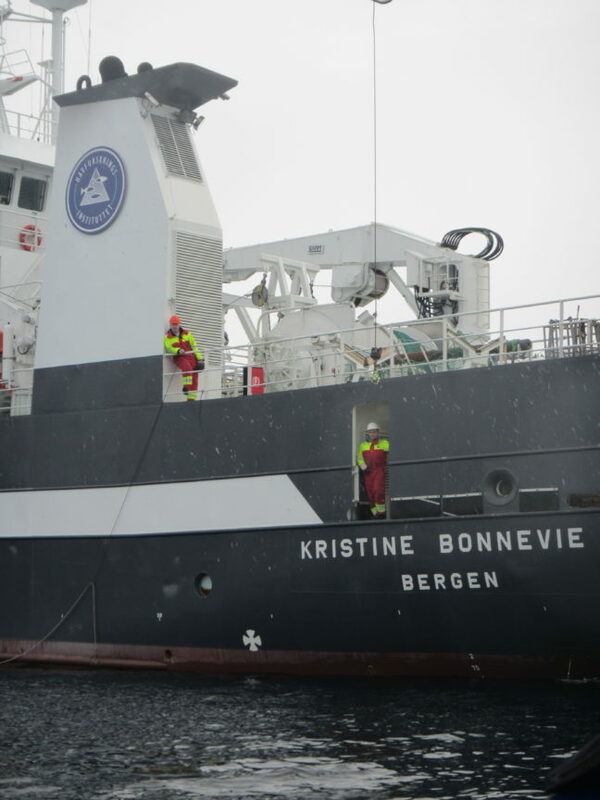 The ship is called Kristine Bonnevie and is one of IMR’s research vessels. 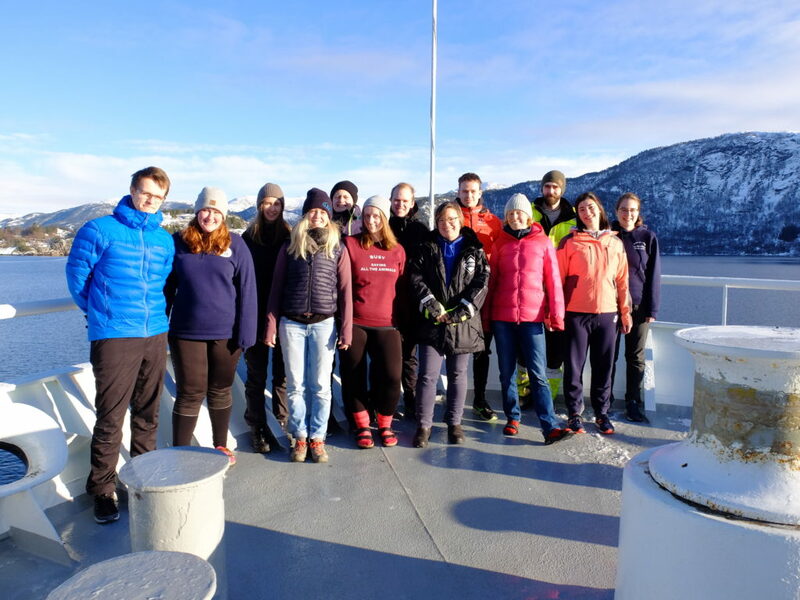 Our study area is mainly Masfjorden, but we are also taking some samples from Fensfjorden, both a five hour journey north of Bergen. 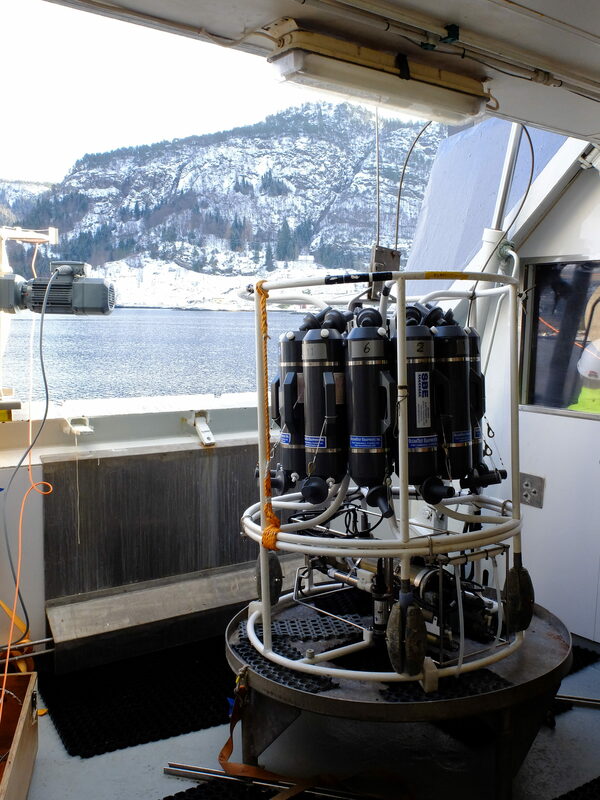 This week we will show you what we typically are doing on a fjord-oceanography cruise. Awesome outreach collaborations to continue: We won a Bjerknes Visiting Fellowship 2018! We are excited and grateful for a great opportunity for continued collaboration that has recently presented itself: Elin won a Bjerknes Visiting Fellowship 2018 for me (Mirjam) to visit Elin and the rest of her team in Bergen for a month in 2018! We have several goals for that visit, but the main one is to develop more hands-on experiments (which we lovingly call “kitchen oceanography”), which parents, teachers, and other educators can use to get children excited about oceanography (and obviously for the grown-ups to play with, too :-)). Between Elin and me, we do already have a lot of experiments which we use regularly and recommend (for Elin’s, check out this site, and mine are here). But we would love to bring them in a different format so that they are easy to find and use, and are well integrated with the ekte data project. And then, obviously, we want to let everybody in Bergen (and all of our faithful readers) know where to find the experiments, and how to use them in science communication. So plenty of stuff to stay tuned for! We’ll absolutely keep you posted on our progress on here! Check out the new way we’ve created to access to Elin & her team’s previous adventures on our “previous adventures” page. 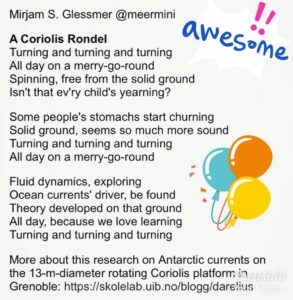 Did you know we have posts in English, Norwegian and Swedish, addressing audiences from primary school kids, over high school pupils, to teachers, our fellow oceanographers and friends and family? Quite impressive how much Elin has written over the years, and fascinating to read, too! 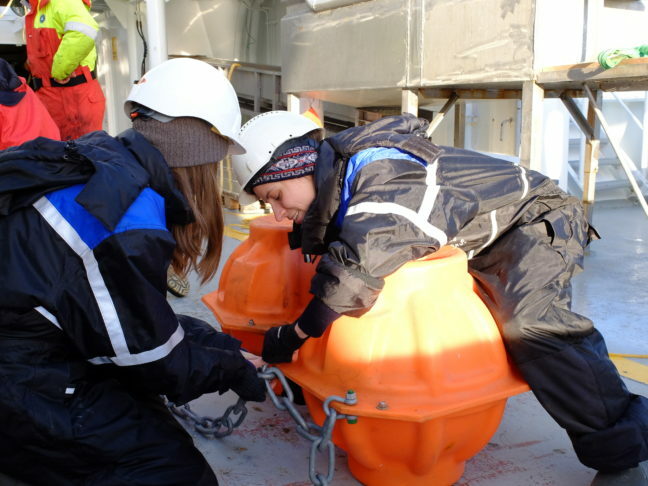 And also check out her ongoing adventures like the student cruise to Bjørnafjorden! 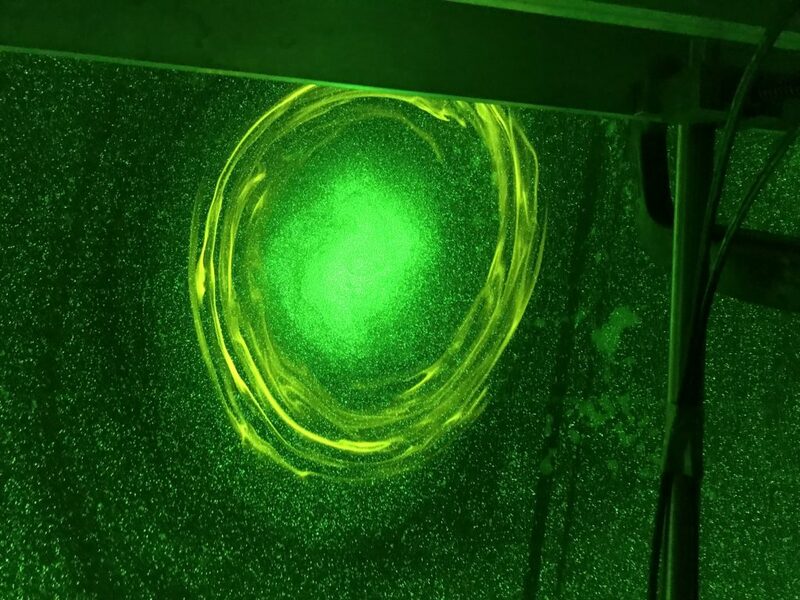 It is the final day of experiments here at the Coriolis platform. The apartment is emptied of personal belongings, bicycles are being returned, goodbyes are stretched out. The lasers will soon be dark, the platform will grind to a halt and the tank will be emptied. It has been a fantastic time! I am amazed at what we have accomplished together during these weeks – answers to some of the most basic questions that are currently asked about the future for the Antarctic ice sheet. The last days have been spent re-running some of the experiments that needed an extra quality-check, and we finished the very last one only an hour ago. Next week I will stay behind alone to try to get some nice photographs of the flow for our future publications. In order to prepare for that we were testing some different dyes. Red dye absorbs the light of the laser efficiently and gives a dark shadow on the images. 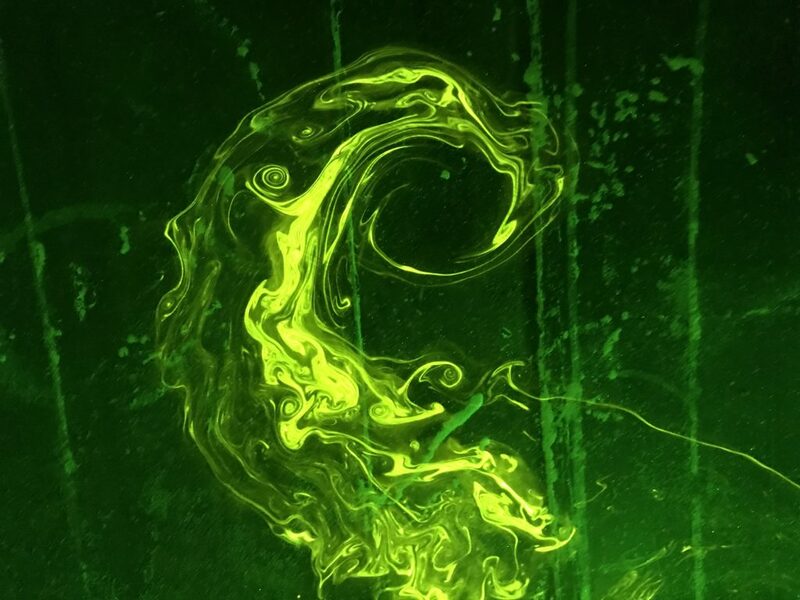 Our all time favorite is Rhodamin – it is a fluorescent dye that produces its own light if you shine on it with green laser. We spent a good hour simply staring at the eddies and flow, mesmerized by the motion and flowing patterns. A very fine ending to the week! And a suitable finale to the time we have spent here on the rotating platform. Video: Visualization of a beautiful barotropic eddy created outside the channel. It stayed like this for a good hour. You can see the barotropic structure since it moves in unison on the surface and below the surface, in a nearly perfect two-dimensional motion.